You are here: Home › Garden design › Do you need a prairie sized border for Prairie Planting? Do you need a prairie sized border for Prairie Planting? 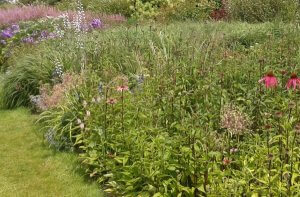 • Comments Off on Do you need a prairie sized border for Prairie Planting? Prairie Planting has been popular for a decade or so now and is a new take on the traditional Herbaceous Border, but with less effort. 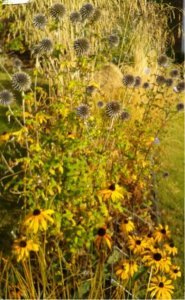 The aim is to provide flower power throughout the summer and right into autumn and end up with a good number of plants that will dry off but remain upstanding all winter. Cultivated flowers and ornamental grasses are planted in large drifts. Close planting and careful choice of varieties mean no staking, fertilising or weeding. Maintenance is limited to mass dead-heading and cutting the whole lot down in early spring. Most prairie borders are on a large scale, after all the clue is in the name, and you do get a wonderful effect of plants swaying in the breeze. But what if your garden is not measured in acres? Do you have to forgo the pleasure of bright cottage flowers contrasted with the wafty heads of ornamental grasses? Well of course the answer is “no”, you can plant exactly what you like and even in a narrow border the texture of grasses and their ability to stand upright through of the winter adds value. Clump forming perennials are ideal: Bergamot, Achillea (Yarrow), Echinacea, Astrantia, Michaelmas daisies and Phlox. The list is almost endless. Eryngium (cultivars of our native Sea Holly) spiky and petrol blue looking great with bronze or purple grasses. There is no shortage of ornamental grasses available these days, but in a smaller space avoid any that are described as ‘vigorous’; you just know that it will end in tears. ← Does your garden need a message?